From patient advocate Mary Shomon, author of Living Well With Hypothyroidism, here is the first book to tackle the weight factors specific to thyroid patients and detail a conventional and alternative plan for lasting weight loss. An estimated 10 million Americans have been diagnosed with thyroid disease--most of them women--and for the majority of them, losing weight is mentioned time and time again as a primary concern and chief frustration--a challenge made more difficult due to the metabolic slowdown of a malfunctioning thyroid gland. For these thyroid patients, treatment alone doesn't seem to resolve weight problems. Further, they may struggle with raising basic metabolism, resolving underlying nutritional deficiencies, treating depression and correcting brain chemistry imbalances, reducing stress, and combating insulin resistance. o The Thyroid Diet will identify these factors that inhibit a thyroid patient's ability to lose weight, and offer solutions--both conventional and alternative--to help. It will discuss optimal dietary changes, including how a thyroid sufferer should focus on a low-glycemic, high-fibre, low-calorie diet, eaten as smaller, more frequent meals to balance blood sugar. The Thyroid Diet addresses the use of various herbs, nutritional supplements, and prescription weight loss drugs, outlining the necessity of exercise, and drawing together all information into an integrated diet and exercise plan. It contains several different eating plans, food lists, and a set of delicious and healthy gourmet recipes. With handy worksheets to use in weight loss tracking, and a special resource section featuring websites, books, and support groups, here is vital help for the millions of thyroid patients dealing with weight problems. o Mary Shomon has been praised by doctors around the country for her medical knowledge and sensitivity to patients' needs. She will be receiving similar blurbs for this new book. 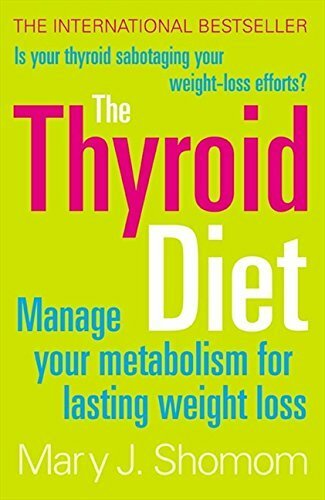 There are no other books on controlling your weight problems if you have a thyroid condition, yet over 40% of overweight people have evidence of a thyroid condition, and the weight loss problems facing them are unique and need a specific approach.